October 09, 2012 Culture » Big Shiny Robot! We who live in Salt Lake City are fortunate enough to have one of the most gorgeous library facilities in the world. Our Salt Lake City Main Library isn’t only modern and spacious, it’s also one of the best places in the state for geeks to get an affordable hit of graphic-novel goodness. Boasting more than 9,000 volumes of comics and graphic novels—more than 15,000 when you count childrens comics and foreign-language editions—the Salt Lake City Main Library’s collection is impressive, wide-ranging and diverse. You’ll find as many classic superhero comics as you will Japanese manga or little-heard-of indie books. Why would it be so important for a library to have a collection of comics? The answer comes from Donnae Tidwell, the librarian who has been curating the Salt Lake City Main Library graphic-novel collection for a year now. Before taking up her current post, she was a librarian and selector for several different libraries across California and Utah. “A solid graphic-novel collection is important to any library,” she says, “because not everyone reads the same way. We tend to identify libraries as a place where you find linear, text-based fiction and other information. In reality, they are places to jump from idea to idea, from frame to frame, much like reading a graphic novel. Currently, the most widely circulated graphic novels in Salt Lake City are a varied bunch, to match the varied tastes of our citizens. Books featuring Marvel comics’ Deadpool are favorites; mainstays like Batman and Robert Kirkman’s The Walking Dead are checked out often. A book I’d never heard of that’s high in circulation is Rice Boy. Tidwell describes it as “colorful and surreal, with a punctuation of collage. Rice Boy takes the common story of a naive boy saving the world and places it in a richly built world. Creator Evan Dahm guides the story through interesting twists and intriguing encounters to keep you reading, yet you can relate to Rice Boy’s world so well that you feel like The Hideous Child Tavern is right around the corner.” She’s convinced me it’s something I need to take a closer look at. That’s the great thing about the library experience: You can sample anything you want and it won’t cost you a penny. You can experiment with manga, read all the great indie comics, and check out any sort of superhero, fantasy or sci-fi comic you can imagine—all under one roof. And if you’re not sure if you’d like something, librarians like Tidwell make it their business to help you find something you like. 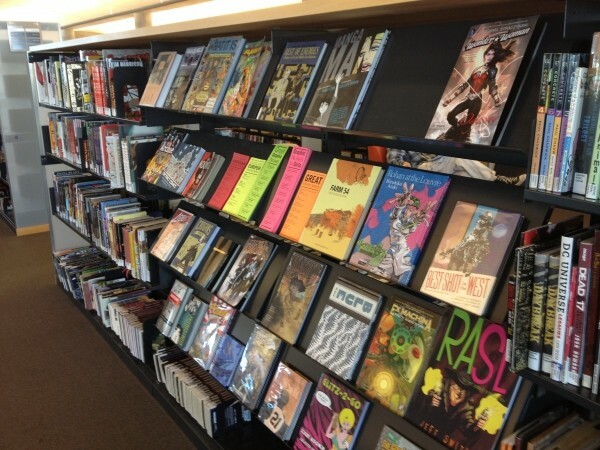 If you haven’t found the nerve to make your way into a comic-book store but still want that taste of comics, there is no better resource than our downtown library.